A one-act opera buffa written for Naples. Donizetti’s La romanzesca e l’uomo nero dates from the same period as Anna Bolena and L’elisir d’amore when the composer’s genius was in full flood. A one-act opera buffa written for Naples. 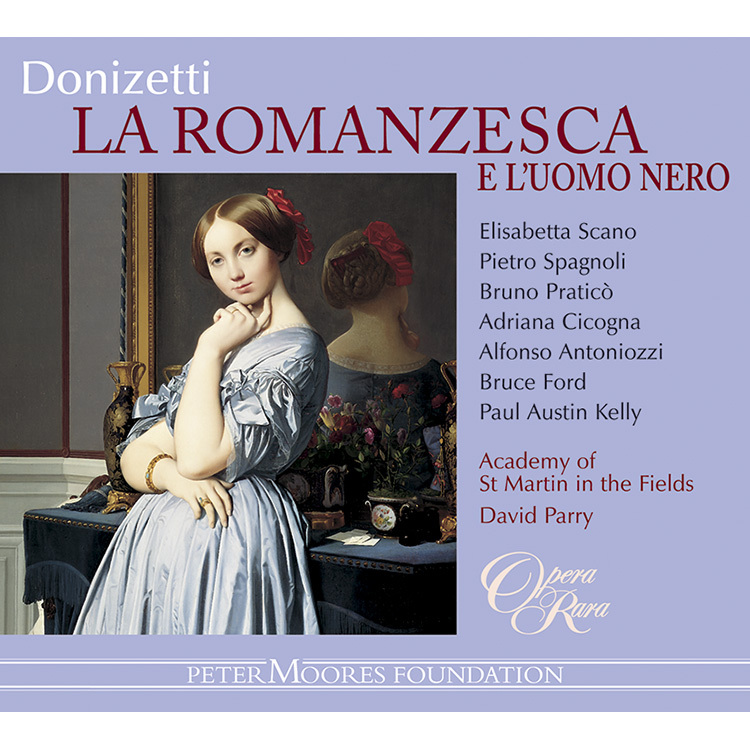 Donizetti’s La romanzesca e l’uomo nero dates from the same period as Anna Bolena and L’elisir d’amore when the composer’s genius was in full flood. The plot satirises the 1830s obsession in Italy with the Gothic and centres on Antonia and her fantasies about the mysterious Man in Black. 02 La romanzesca e l’uomo nero: scena I: M’insulta, corbella! 05 La romanzesca e l’uomo nero: scena III: Duetto: Ciel! Fia ver? Mio Filidoro! 10 La romanzesca e l’uomo nero: scena V: Duetto: Che paura! Che paura! 11 La romanzesca e l’uomo nero: scena V: Duetto: Ah! Ah! Ah! Ah! 12 La romanzesca e l’uomo nero: scena VI: Terzetto: Fuggiam, fuggiam! 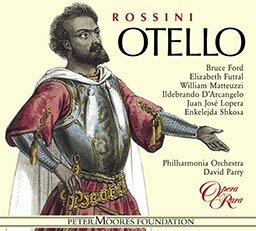 When this opera was performed in 1831, the sung items were linked by passages of spoken dialogue. Since no full libretto appears to survive, these passages of dialogue are now lost. And since the action would seem to be significantly changed from that of the ultimate source-play, Augusto Bon’s La donna dei romanzi (1819), the following account of the plot can be no more than conjectural. No claim can be made that it reproduces the authentic action that was performed in 1831. The scene is laid in the palazzo of the Count, who has just returned from a two-year trip with a friend, Baron Ruperti. They have decided to seal their friendship with an alliance between their families. It is therefore planned that Carlino, Baron Ruperti’s only son, should marry Antonia, the Count’s only daughter. Before leaving home, the Count has engaged a governess, Trappolina, to take charge of Antonia’s education, and had summoned home from the convent where she was at school his orphaned niece, Chiarina, intending that the two girls should keep each other company. They have soon discovered, however, that they have little in common. Antonia, a great reader of romantic novels and poetry, lives in a totally unrealistic world of her own concocting; whereas Chiarina is open and confiding, but also very naïve, immature and impetuous. Trappolina, far from showing herself a responsible governess, has proved a scheming adventuress. To bring Antonia under her sway, she has openly encouraged her romantic excesses. At her governess’s urging, Antonia has had Giappone, the Count’s faithful steward, demolish two ancient but perfectly serviceable dovecots at the bottom of the garden, and construct a Gothic ruin in their place. There she, calling herself Atala, and Trappolina, styling herself Ines, resort every evening to commune with Nature. Trappolina has found an ally in the household in the elderly, hypochondriac and unwashed tutor, Tommaso. Tommaso never stops complaining that the Count is an ungenerous employer, but these are the lamentations of a hypocrite. Originally a barber by trade, he has become ambitious and grasping. Calling himself ‘il Solitario’ (‘the Solitary’), he has gained an ascendancy over Antonia by passing himself off as a metaphysical philosopher. An orator whom one understands less as one listens to him more, he continually speaks in elaborate but meaningless metaphors. Tommaso, in turn, has tried to turn the Count’s absence to his advantage by introducing his equally unscrupulous nephew, Filidoro, into the household. Filidoro, also a barber, has ingratiated himself with Antonia by calling himself ‘l’Uomo Nero’ (‘the Black Man’), a person of mysterious and secret background. Constantly muffled up in black clothes and board-brimmed, black-plumed hat, he claims to be bound by an oath not to reveal the mystery of his birth for fifteen years, one of which conveniently still has to run. Carlino, as a result of his father’s friendship with the Count, is a frequent visitor to the house. But he is repelled by Antonia’s romantic fatuities, and has fallen in love with, or at least becomes temporarily attracted to, Chiarina. He has therefore learned with dismay of the plan that he should marry Antonia, and hears with even greater distress that the ceremony is likely to be imminent. The Count, increasingly irate as he is told of Antonia’s romantic excesses, sends Trappolina and Tommaso to inform her that she must marry Carlino the very next day. She, just as unattracted to Carlino as he to her, throws herself for ‘protection’ into the arms of Filidoro. With the aid of Trappolina and Tommaso, Antonia and Filidoro plan to elope. They hope to gain assistance from another of the household servants, Nicola, and instruct him to have a post-chaise waiting for them that night half a mile from the house. Despite Antonia’s enthusiasm for living in romantic poverty, she voices no objection when Filidoro and Tommaso suggest taking her jewellery with them. Filidoro is as yet unknown to the Count, and must be hidden until the moment for the elopement arrives. Unwisely he is entrusted to the care of Nicola, who, really out to feather his own nest, shuts him in a cupboard in Chiarina’s bedroom, intending to take his place in the dark and to abscond with a large part of Antonia’s jewels. Complications multiply. Chiarina is being pursued by a fatuous young suitor named Fedele, but when he finds that she has a man concealed in her room, he turns his attentions elsewhere – to Antonia. Chiarina releases Filidoro, who, ever the opportunist, forgets all about his vaunted passion for Antonia and sets about pursuing Chiarina. She, for her part, remains in mortal fear of this ‘black man’. It is time for the elopement to take place – with Nicola impersonating Filidoro. There is, however, no honour or trust between thieves. Filidoro, believing that Tommaso, Trappolina and Nicola are in league to outwit him, turns informant and buys his pardon from the Count by revealing all that is afoot. As a result the fleeing party is apprehended and justice is meted out to all. 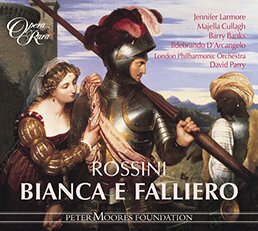 Tommaso, Trappolina and Nicola are sent packing, while Antonia is at last brought to see the error of her ways when she learns that Filidoro, far form being a man of mystery, is a mere barber. She is given an unwelcome choice: either to marry Fedele, or to be banished from her father’s home. She pleads against marriage to Fedele, and Carlino, coming to her aid, tells Fedele he must remain celibate. Antonia makes a solemn promise that she will renounce all romantic aberrations, and clearly gains her father’s pardon. Whether or not she marries Carlino remains unclear. It is also uncertain what happens to Chiarina: perhaps she is sent back to her convent until she grows up a little. Filidoro philosophically accepts his fate: that he must revert to his calling as a barber. Bei der Aufführung dieser Oper im Jahr 1831 wurden die gesungenen Passagen durch gesprochenen Dialog miteinander verbunden. Soweit man weiß, ist kein vollständiges Libretto erhalten geblieben und der gesprochene Text ist offenbar verloren gegangen. Da die Handlung der Oper vermutlich stark von der Vorlage, Augusto Bons Drama La donna dei romanzi (1819), abweicht, kann die folgende Zusammenfassung nur eine Annäherung sein und keinen Anspruch darauf erheben, die tatsächliche Handlung der Opernfassung von 1831 getreu wiederzugeben. Ort der Handlung ist der Palazzo des Grafen, der soeben von einer zwei Jahre währenden Reise mit seinem Freund Baron Ruperti zurückgekehrt ist. Die beiden wollen ihre Freundschaft durch eine Verbindung ihrer Familien besiegeln und beschließen deshalb eine Vermählung von Carlino, dem einzige Sohn des Barons, mit Antonia, der einzigen Tochter des Grafen. Vor seiner Abreise hatte der Graf die Gouvernante Trappolina engagiert, die sich um die Erziehung seiner Tochter kümmern sollte, und zur Gesellschaft Antonias hatte er seine verwaiste Nichte Chiarina aus der Klosterschule ins Haus geholt. Doch die beiden Mädchen stellten bald fest, dass große Unterschiede zwischen ihnen bestehen. Antonia hat eine Vorliebe für romantische Romane und lyrische Dichtung und lebt in einer Welt, die wenig mit der Realität zu tun hat; Chiarina hingegen ist offen und vertrauensvoll, aber auch sehr naiv, unreif und impulsiv. Trappolina erwies sich sehr bald als intrigante Abenteurerin. Um Antonia für sich zu gewinnen, bestärkte sie sie noch in ihrer romantischen Exaltiertheit und drängte sie etwa dazu, von Giappone, dem getreuen Diener des Grafen, zwei alte, aber gut erhaltene Taubenschläge im Garten niederreißen und an ihrer Stelle eine gothische Ruine errichten zu lassen. Dorthin ziehen sich Antonia und Trappolina – die sich bei diesen Gelegenheiten als Atala und Ines ausgeben – jeden Abend zurück, um mit der Natur zu kommunizieren. Einen Verbündeten hat Trappolina in der Gestalt Tommasos gefunden, des ältlichen, hypochondrischen und nicht sehr reinlichen Hauslehrers. Dieser beschwert sich unablässig über den Geiz seines Arbeitgebers, doch sind dies scheinheilige Klagen, denn Tommaso, der früher als Barbier sein Brot verdiente, ist ehrgeizig und habsüchtig geworden. Er nennt sich “il Solitario” (“der Einsame”) und hat übermächtigen Einfluss auf Antonia gewonnen, indem er sich zum metaphysischen Philosophen stilisierte. Seine Reden versteht man umso weniger, je länger man ihm zuhört, denn er spricht fortwährend in kunstvollen, aber bedeutungslosen Metaphern. Auch Tommaso hat versucht, die Abwesenheit des Grafen zu seinem Vorteil zu nutzen, und seinen nicht minder skrupellosen Neffen Filidoro im Haushalt eingeführt. Dieser, ebenfalls Barbier, schmeichelte sich bei Antonia ein, indem er sich als “l’Uomo Nero” ausgibt, “der Schwarze”, ein Mann von mysteriöser Herkunft. Er hüllt sich stets in schwarze Gewänder, einen breitkrempigen Hut mit schwarzen Federn auf dem Kopf, und behauptet, durch einen Eid gebunden zu sein, das Geheimnis seiner Geburt fünfzehn Jahre lang nicht aufdecken zu dürfen – von denen das letzte noch nicht um ist. Auch Carlino, der Sohn des Barons, ist aufgrund der Freundschaft seines Vaters mit dem Grafen häufig im Palazzo zu Gast. Er fühlt sich von Antonias romantischer Überstiegenheit abgestoßen und hat sich in Chiarina verliebt oder fühlt sich zumindest kurzzeitig zu ihr hingezogen. So ist er denn auch sehr bekümmert über die Pläne seines Vaters, ihn mit Antonia zu vermählen, und noch mehr entsetzt es ihn zu hören, dass die Eheschließung in allernächster Zukunft stattfinden soll. Voll Zorn über die romantische Verstiegenheit seiner Tochter lässt der Graf ihr durch Trappolina und Tommaso ausrichten, dass sie schon am folgenden Tag mit Carlino den Bund der Ehe schließen müsse. Antonia, die Carlinos Abneigung erwidert, wirft sich “hilfesuchend” in Filidoros Arme. Antonia und Filidoro schmieden Pläne, um mit der Hilfe Trappolinas und Tommasos zu fliehen. Auch bei Nicola, einem weiteren Angestellten des Grafen, hoffen sie Unterstützung zu finden und tragen ihm auf, in der kommenden Nacht eine Kutsche eine halbe Meile vom Haus bereitzustellen. Obwohl Antonia von einem Leben in romantischer Armut schwärmt, erhebt sie keinen Einspruch, als Filidoro und Tommaso ihr vorschlagen, ihren Schmuck mitzunehmen. Da Filidoro dem Grafen nicht bekannt ist, muss er bis zur Flucht verborgen bleiben. Unklugerweise wird er der Obhut Nicolas überlassen, der in Wirklichkeit nur seinen eigenen Nutzen im Sinn hat und ihn in einem Schrank in Chiarinas Zimmer einschließt. In der Dunkelheit will er sich als Filidoro ausgeben und mit dem Großteil von Antonias Schmuck verschwinden. Die Komplikationen mehren sich. Chiarina wird von einem leidenschaftlichen Verehrer names Fedele verfolgt, doch als dieser entdeckt, dass sie einen Mann in ihrem Zimmer verbirgt, wendet er seine Aufmerksamkeit Antonia zu. Chiarina holt Filidoro aus dem Schrank, der – Opportunist durch und durch – seine angeblich unsterbliche Liebe zu Antonia augenblicklich vergisst und Chiarina umwirbt, die ihre Angst vor dem “schwarzen Mann” aber nicht überwinden kann. Der Zeitpunkt der Flucht ist gekommen, Nicola nimmt Filidoros Rolle ein. Doch Gauner kennen kein Gefühl für Anstand. Filidoro ist überzeugt, dass Tommaso, Trappolina und Nicola ihn übervorteilen wollen, und deckt dem Grafen den Fluchtplan auf, woraufhin dieser ihm verzeiht. Die Fliehenden werden abgefangen, die Gerechtigkeit nimmt ihren Lauf. Tommaso, Trappolina und Nicola werden aus dem Haus vertrieben. Als Antonia erfährt, dass Filidoro keineswegs ein geheimnisumwitterter Mann ist sondern ein einfacher Barbier, wird ihr schließlich das Ausmaß ihrer Narretei bewusst. Ihr Vater stellt sie vor eine unerquickliche Wahl: Entweder sie heiratet Fedele oder sie wird aus dem Haus verbannt. Als sie ihren Vater anfleht, er möge ihr die Ehe mit Fedele ersparen, kommt Carlino ihr zur Hilfe und verpflichtet Fedele, Junggeselle zu bleiben. Antonia schwört feierlich allen romantischen Träumereien ab und ihr Vater verzeiht ihr. Ob sie Carlino heiratet oder nicht, bleibt ebenso offen wie das weitere Schicksal Chiarinas; möglicherweise wird sie für einige Jahre ins Kloster zurückgeschickt. Filidoro seinerseits ergibt sich mit philosophischer Gelassenheit seinem Schicksal und wird wieder zum Barbier. Nel 1831, anno in cui venne rappresentata, quest’opera riuniva brani cantati inframmezzati da alcuni dialoghi recitati. Poiché sembra che non sia rimasto un libretto completo, questi brani di dialogo sono andati perduti. E poiché sembra che la trama sia stata significativamente modificata rispetto a quella dell’originale teatrale a cui si ispira, La donna dei romanzi (1819) di Augusto Bon, la seguente narrazione è solo una congettura. È improbabile che sia fedele alla storia effettivamente rappresentata nel 1831. La scena si svolge nel palazzo del Conte, appena rientrato da un viaggio durato due anni con un amico, il barone Ruperti. Entrambi hanno deciso di consolidare la loro amicizia con un’alleanza tra le due famiglie. Viene quindi stabilito che Carlino, unico figlio del barone Ruperti, sposi Antonia, unica figlia del conte. Prima di partire, il Conte aveva assunto una governante, Trappolina, perché curasse l’educazione di Antonia, e aveva richiamato a casa Chiarina, una nipote orfana, dal convento dove veniva educata, perché le due ragazze si facessero compagnia. Ben presto le cugine avevano però scoperto di avere poco in comune. Antonia, appassionata lettrice di romanzi e poesia romantica, viveva in un mondo ideale tutto suo, mentre Chiarina, aperta e fiduciosa, era anche molto ingenua, immatura ed impetuosa. Anziché essere una governante responsabile, Trappolina si rivela un’avventuriera intrigante. Per riuscire a dominare Antonia, incoraggia apertamente i suoi eccessi romantici. Su suggerimento della governante, Antonia ha fatto demolire da Giappone, fedele maggiordomo del Conte, due colombaie vecchie, ma perfettamente funzionanti, in fondo al giardino, per far costruire al loro posto un rudere gotico. Qui, ogni sera, prende il nome di Atala e, con Trappolina, nelle vesti di Ines, entra in comunione con la Natura. In casa, Trappolina ha trovato un alleato nell’anziano Tommaso, insegnante, ipocondriaco e poco pulito. Tommaso non fa che criticare la poca generosità del Conte, ma le sue sono le lagnanze ipocrite di un barbiere ambizioso e avido. “Il Solitario” (questo, il nome da lui assunto), ha ottenuto un notevole ascendente su Antonia, che lo crede un filosofo metafisico, per i suoi discorsi interminabili e incomprensibili, infarciti di metafore complesse e senza significato. Anche Tommaso ha cercato di sfruttare a proprio vantaggio l’assenza del Conte, introducendo in casa Filidoro, un suo nipote altrettanto privo di scrupoli. Filidoro è barbiere come lo zio, ed è entrato nelle grazie di Antonia, assumendo l’identità di “Uomo Nero”, una persona dal passato misterioso e segreto. Costantemente paludato in indumenti neri e con un cappello nero a tesa larga, adorno di una penna nera, dichiara di aver giurato di non rivelare il misterio della propria nascita per quindici anni; alla data della rivelazione manca, per curiosa coincidenza, proprio un anno. A causa dell’amicizia di suo padre con il conte, Carlino è ormai un visitatore frequente della casa. Ma viene respinto dal fatuo romanticismo di Antonia e si innamora, o si invaghisce temporaneamente, da Chiarina. Rimane sconvolto quando gli viene rivelato il progetto di fargli sposare Antonia, e si addolora ancora di più quando viene a sapere che la cerimonia potrebbe essere imminente. Il conte, sempre più irato al sentir parlare degli eccessi romantici di Antonia, invia Trappolina e Tommaso a dirle che dovrà sposare Carlino il giorno dopo. La fanciulla, che ricambia totalmente l’indifferenza di Carlino, si getta nelle braccia di Filidoro, in cerca di “protezione”. Con l’aiuto di Trappolina e Tommaso, Antonia e Filidoro meditano di fuggire insieme. Sperano di farsi aiutare da Nicola, un altro servitore della casa, e gli ordinano di preparare una carrozza che dovrà attenderli quella notte, a mezzo miglio dalla casa. Nonostante il suo entusiasmo per la povertà romantica, Antonia non ha alcuna obiezione quando Filidoro e Tommaso le consigliano di portarsi dietro i propri gioielli. Il Conte non conosce ancora Filidoro, che dovrà rimanere nascosto fino al momento della fuga. Malauguratamente, viene affidato alle cure di Nicola che, pensando al proprio personale tornaconto, lo chiude in un armadio nella camera da letto di Chiarina; intende prendere il suo posto con il favore dell’oscurità, per poi fuggire con una gran parte dei gioielli di Antonia. Le complicazioni si moltiplicano. Fedele, un giovane fatuo, corteggia Chiarina; quando però scopre che c’è un uomo nascosto nella sua camera, rivolge la sua attenzione ad un’altra persona: Antonia. Chiarina libera Filidoro, che sempre opportunista, dimentica la passione dichiarata ad Antonia e inizia a corteggiare Chiarina. Lei, da parte sua, continua ad essere terrorizzata da quest’“uomo nero”. Arriva il momento della fuga degli innamorati: Nicola è travestito in modo da sembrare Filidoro. Ma non esiste onore né fiducia tra ladri. Convinto che Tommaso, Trappolina e Nicola siano in combutta contro di lui, Filidoro si trasforma in spia e si fa perdonare dal Conte, rivelandogli tutte le trame che si stanno preparando. Così il gruppetto di fuggiaschi viene catturato e si fa giustizia per tutti. Tommaso, Trappolina e Nicola vengono cacciati via; Antonia si rende conto dei propri errori quando viene a sapere che Filidoro non è un uomo misterioso, ma un semplice barbiere. Adesso ha davanti una scelta sgradevole: sposare Fedele o essere cacciata di casa dal padre. Davanti alle implorazioni della ragazza che non desidera questo matrimonio, Carlino interviene a suo favore, ordinando a Fedele di rimanere celibe. Antonia promette solennemente di rinunciare a tutte le aberrazioni romantiche e ottiene il perdono del padre. Non è chiaro se sposerà Carlino oppure no. Inoltre non si capisce bene quale sarà la sorte di Chiarina: forse verrà rimandata in convento, per maturare ancora un po’. Filidoro accetta il suo destino con filosofia e torna alla sua vocazione di barbiere. Lors des représentations de cet opéra, en 1831, les arias étaient reliés entre eux par des dialogues parlés. Aucun exemplaire du livret complet n’ayant survécu à ce jour, toute trace des dialogues s’est perdue. Il semblerait que l’intrigue diffère sensiblement de celle de la pièce de théâtre dont elle s’inspire, La donna dei romanzi d’Augusto Bon (1819), aussi en sommes-nous réduits aux conjectures. La reconstitution qui suit ne saurait être un résumé authentique de l’opéra tel qu’il fut représenté en 1831. La scène se déroule dans la demeure du comte, de retour dans son palais après un voyage de deux ans en compagnie du baron Ruperti, son ami. Pour sceller leur amitié, les deux hommes ont convenu que le fils unique du baron, Carlino, épouserait la fille unique du comte, Antonia. Avant ce voyage, le comte a engagé Trappolina comme gouvernante et l’a chargée de s’occuper de l’éducation d’Antonia en son absence. Pour tenir compagnie à sa fille, le comte a également fait venir au palais sa nièce, Chiarina, jeune orpheline confiée jusque-là aux bons soins d’un couvent. Les deux jeunes filles ne tardent pas à découvrir qu’elles ont bien peu en commun. Lectrice avide de romans et de poésie, Antonia vit dans un monde imaginaire qu’elle a construit de toutes pièces. Ouverte et sans méfiance, Chiarina est plutôt vive, naïve et immature. Loin d’être à la hauteur de ses responsabilités, Trappolina est, en fait, une intriguante et une aventurière. Elle encourage le romantisme excessif d’Antonia pour mieux la dominer. A son incitation, Antonia a ordonné à Giappone, le fidèle domestique du comte, de démolir deux anciens pigeonniers encore en très bon état au fond du jardin pour y faire bâtir à la place une ruine gothique. C’est là que chaque soir Atala et Inès, alias Antonia et Trappolina, se retrouvent pour communier avec la Nature. Trappolina s’est trouvé un allié en la personne d’un prétendu ‘tuteur’ hypochondriaque et mal odorant du nom de Tommaso. Ce dernier se plaint constamment du manque de générosité du comte, son employeur, mais par pure hypocrisie. Il s’agit, en effet, d’un ancien barbier devenu ambitieux et cupide. Il a pris de l’ascendant sur Antonia en se faisant appeler ‘il Solitario’ (‘le Solitaire’), et en prenant des airs de philosophe versé dans la métaphysique. Ses discours, de plus en incompréhensibles à mesure qu’on les écoute, regorgent de métaphores obscures et ridicules. Profitant de l’absence du comte, Tommaso a introduit son neveu Filidoro au palais. Comme son oncle, Filidoro est un ancien barbier dénué de scrupules qui s’insinue dans les bonnes grâces d’Antonia en se faisant appeler ‘l’Uomo Nero’ (‘l’Homme noir’) et en se faisant passer pour un personnage mystérieux dont l’origine doit rester secrète. Le corps emmitouflé dans des vêtements sombres et la tête recouverte d’un feutre à larges bords orné d’une plume noire, il se dit lié par un serment lui interdisant de révéler le mystère de sa naissance pendant quinze ans, délai qui n’expirera, bien entendu, que l’année suivante. En raison de l’amitié qui lie le comte à son père, Carlino se rend fréquemment au palais. Rebuté par la sottise d’Antonia et son romantisme débridé, il tombe amoureux ou, du moins, s’attache momentanément à Chiarina. Il est consternaté d’apprendre qu’il est censé épouser Antonia et que la cérémonie est imminente. Le comte, de plus en plus excédé par les folies d’Antonia, envoie Trappolina et Tommaso auprès de celle-ci pour lui faire savoir qu’elle épousera Carlino le lendemain. Le manque d’attirance étant réciproque, Antonia se jette dans les bras de Filidoro en le suppliant de lui prêter secours. Avec l’aide de Trappolina et de Tommaso, Antonia et Filidoro décident de s’enfuir ensemble. Ils espèrent pouvoir compter sur l’assistance de Nicola, un autre domestique auquel ils demandent de mettre une chaise de poste à leur disposition non loin du palais la nuit suivante. Bien que la romantique Antonia se dise prête à vivre dans le dénuement et la pauvreté, elle obéit à Filidoro et Tommaso qui lui suggèrent d’emporter ses bijoux. Le comte ignorant tout de son existence, Filidoro doit rester caché jusqu’au moment de l’enlèvement. Il fait l’erreur de mettre son sort entre les mains de Nicola. Le coquin l’enferme à l’intérieur d’un placard dans la chambre de Chiarina, avec la ferme intention de profiter de l’obscurité de la nuit pour prendre sa place et disparaître avec les bijoux d’Antonia. Les péripéties se multiplient. Un jeune fat prénommé Fedele, qui poursuit Chiarina de ses assiduités, découvre l’homme caché dans la chambre de celle-ci et tourne son affection vers une autre – Antonia. Lorsque Chiarina le libère, Filidoro en profite pour oublier la passion qu’il dit vouer à Antonia pour tenter de séduire Chiarina, à qui ‘l’Homme noir’ inspire une véritable terreur. Mais le moment de l’enlèvement approche. Nicola essaie de se faire passer pour Filidoro. Mais l’honneur et la confiance ne règnent guère chez les voleurs. Persuadé que Tommaso, Trappolina et Nicola se sont ligués contre lui, Filidoro change de camp et s’assure le pardon du comte en lui révélant la conspiration. Les trois larrons en fuite sont arrêtés et justice est faite : Tommaso, Trappolina et Nicola sont renvoyés du palais. Quant à Antonia, elle comprend enfin qu’elle s’est leurrée en apprenant que Filidoro, loin d’être un personnage de mystère, est barbier de son état. Elle se voit alors placée devant une dure alternative: épouser Fedele ou quitter à tout jamais le palais de son père. Elle supplie qu’on lui épargne cette alliance et Carlino, lui venant en aide, dit à Fedele de renoncer au mariage. Antonia promet solennellement d’abandonner ses illusions romantiques et obtient manifestement le pardon de son père. Epouse-t-elle ou non Carlino ? On ne saurait l’affirmer. La même incertitude pèse sur le sort de Chiarina: peut-être retrouve-t-elle le chemin du couvent où elle aura le temps de mûrir un peu. Filidoro accepte philosophiquement son destin: il retourne à son métier de barbier.